The months of August and September are loaded with typical Belgian one-day races that suit a mix of sprinters and classics riders and after Dwars door Het Hageland kicked the series off, things intensifies this week as there will be races on Sunday, Tuesday, Wednesday and Sunday. After the hilly GP Jef Scherens, GP Stad Zottegem and Druivenkoers Overijse, the series ends with the unique Schaal Sels whose gravel roads turn it into one of the most exciting races on the calendar and inspire both road and cyclo-cross riders. While the spring offers a mix of stage and one-day races and the first part of the summer is all about stage racing, the second half of the year is for the one-day riders. After the Tour de France, the Vuelta a Espana is the only big race for the grand tour and stage race specialists while the late summer and the autumn are loaded with lots of one-day races throughout Europe. The highlight is Il Lombardia and Clasica San Sebastian, Vattenfall Cyclassics, GP Plouay and the Canadian races also offer important WorldTour points. The list also includes historic races like Paris-Tours, Giro dell’Emilia, Tre Valli Varesine and Milan-Turin and the calendar offers a wide variety of terrain for sprinters, classics specialists and even climbers. In addition to the bigger races, there are a number of smaller races. Traditionally, the two key countries for one-day racing, Belgium and Italy, have both had a rich calendar of small semi-classics but nowadays most of the Italian events have disappeared. Things are different in Belgium where the economic crisis hasn’t hit as hard and most of the fascinating list of typical Belgian races is intact. The series of semi-classics started earlier than usual with the return of the Dwars door Het Hageland in the first week of August but now is the time when the hectic period really starts. During the last eight days, no less than four Belgian one-day races have been on the menu and they are all pretty similar, suiting a mixing of sprinters and classics riders. After Dimitri Clayes’ win at GP Jef Scheren – Rondom Leuven, Tim Merlier’s victory at GP Stad Zottegem and Jerome Baugnies’ solo ride at Wednesday’s Druivenkoers Overijse, the final race in the series is the Schaal Sels which is one of the most spectacular races on the calendar. Last year the organizers changed the race completely as they included lots of gravel roads and this turned it into a huge spectacle. Some liked the format, others were critical and found it to be on the limit of what a road race can offer but the organizers liked the idea and have stuck to the format. Schaal Sels is actually a very old race which was first held in 1921 in memory of cycling journalist Jacques-Charles Schels who died at the Milan-Antwerp race on year earlier. It was held for the second time in 1923 and since then it has been on the calendar every year apart from a few cancelled editions during World War II and another cancellation in 2014. For most of the time, it has been a relatively low-key event on the Belgian calendar. In 1997, it was added to the UCI calendar and got a great start as Tom Steels won the race and world champion Johan Musseuw was in attendance. Since then, it has gradually moved up in the ranks and is now a 1.1 race on the international calendar. Unfortunately, it doesn’t have the same prestige as the other Belgian semi-classics that are held at this time of the year and it has mostly been dominated by Belgian riders – even if the most successful rider in the race is Dutchman Steven De Jongh who won three editions. The first edition of the revamped race was won by Robin Stenuit who beat Oliver Naesen in a two-rider sprint while Tim Merlier won the sprint for third from a small group four seconds later. As said, the organizers have opted to stick to the unique format that they introduced last year. This year the riders will cover 194.74km with stat and finish in Merksem. There won’t be a single climb on the completely flat course and instead the challenge will be the cobbles and the gravel roads. There is over 33 km of cobblestone sections and another 33 km of gravel roads, with the parcours winding through small roads, doubling back on itself and using every sector several times. In the end, the riders will do one la of a 15km circuit that is also completely flat. It is only the second year that the race will have the new format and so many are still a bit in the unknown when it comes to what to expect. However, last year’s edition turned into a true elimination race where only the strongest classics riders and the best bike handlers were left in the end. Climbing skills are not important unlike in Dwars door Het Hageland where there are a few hellingen on the menu. The race is much like a small Paris-Roubaix where the difference is made by brute force and where luck plays a big role. Things would have been made harder if it had been rainy day but Sunday is forecasted to be sunny and hot. However, it will be very windy and this will only make things harder. We expect it to be very similar to last year’s race and so we expect it to be a constant elimination until only the strongest are left. This suits Pieter Vanspeybrouck down to the ground. The Topsport rider has had a breakthrough season and has been up there in lots of races. He was strong in the cobbled classics and has been competitive in short stage races too. Recently he showed his good form in Burgos and Limousin and on Tuesday he dropped everybody with a big attack on the Paddestraat cobbles in the finale. Toay he won the small Omloop Mandel race and he has really hit peak condition for the final part of the season. Vanspeybrouck’s performance in the classics proves that he has what it takes to be competitive at the end of a long, hard race. He is excellent on the cobbles and he is fast in a sprint. With the form he has at the moment, he is probably the strongest rider and so he is our favourite. Unsurprisingly, Wout Van Aert has made a short return to the road for this race even though he is in full preparation for the cyclo-cross season. This year has been a bit of a road breakthrough for him as he won the prologue at the Belgium Tour, almost won the Ster ZLM Toer queen stage and was one of the best in the Belgian championships. He was really strong in the similar Dwars door Het Hageland and has the bike-handling skills and the engine to do well here. Furthermore, he is reasonably fast in a sprint but he would have loved a few climbs to make things a bit punchier. Baptiste Planckaert is the revelation of the Belgian and French season and he will keen to continue his momentum here. He has been extremely consistent and showed good form when he won the hard final stage at the Czech Cycling Tour. Last Tuesday he was constantly on the attack in Zottegem. He is known as a sprinter but he can handle the cobbles as well which he proved at the Belgium Tour. He should be there in a selective race and if he is there in the finale, he will be almost impossible to beat in a sprint. Timothy Dupont is the other big revelation on the continental scene. He has been in outstanding form recently where he has won numerous races. He was close to victory in Zottegem where he finished second and rode aggressively. He has shown that he can handle tough conditions. He may not be as strong as Planckaert but he is probably a bit faster in a sprint. Crelan also have Tim Merlier who was already close to victory in last year’s race. Like his captain Van Aert, he is a cyclo-cross rider so he has the skills to do well here. Furthermore, his form is excellent as he took a breakthrough win in Zottegem where he beat Dupont in a sprint. 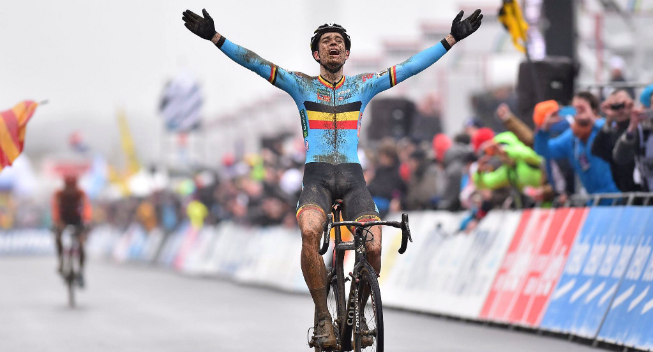 He may not be as strong as Van Aert but he is much faster and has proved that he can beat the best. In addition to Dupont, Veranda’s Willems have Dries De Bondt who took a breakthrough win at Halle-Ingooigem. He is back on form as he won the Belgian title for riders without contract and he was constantly on the attack in Zottegem and GP Jef Scherens. He excels in a hard race and is fast in a sprint. Cyclo-cross rider Gianni Vermeersch has also shown solid potential on the road. Wanty have the two sprinters Roy Jans and Kenny Dehaes. This race is probably too hard for them but none of them are pure sprinters. Especially Dehaes has often done well in classics too and he should find the course to his liking. However, he has not been in his best form recently. Jans has had lots of setbacks but finally seems to have some form. The team also have Tom Devriendt who may be strong enough to handle the terrain and is fast in a sprint. Another fast finisher is Roman Maikin who showed his excellent form with his uphill sprint win in Limousin. However, he is untested in this terrain. In addition to Vanspeybrouck, Topsport Vlaanderen have Tim Declercq who excels in hard races like this. Roompot also have some strong guys like Brian Van Goethem and Berden De Vries while Michel Kreder should be there if a small group sprints for the win. Raymond Kreder is also at the start and would usually have been a good candidate but he has just come back from injury. Steele Von Hoff is another fast rider who may be able to handle this kind of hard race as are Coen Vermeltfoort, Wouter Mol and Jetse Bol. Rasmus Guldhammer should be one of the strongest riders here but he has not been at his best in 2016 and the course is not hilly enough to suit him well. Alex Kirsch could be a back-up plan for Stölting but he has just come back from injury. Finally, we will point to the talented Brit Jonathan Dibben who was good in the U23 Tour of Flanders and has just been doing the Tour of Utah as a Cannondale stagiaire.